Arthur from Exmoor School Of Motoring has recently been made member of the year at the Motor Schools Association. 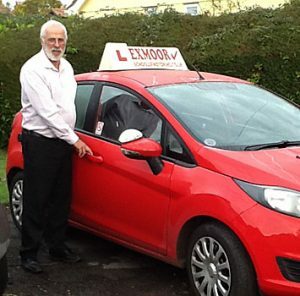 promote higher standards for driver trainers in his area"
Hello and welcome to Exmoor School of Motoring. Well, you've come to the right place because I can help you to get one. Just imagine, no more waiting around for the bus after college if you finish early. No more getting to college on the only bus in the morning and having to wait half a day if your first lesson is in the afternoon. You can just jump in to your car and arrive and leave when YOU need to!! No more relying on friends and family to take you to work or out socialising in the evenings and weekends. Complete freedom to do what you want and when you want!! Now here's a fact for you. Do you realise the national pass rate for driving tests in Great Britain is 47%*? That means that out of every 100 tests taken 53 are failing! You may think that's okay but I'm afraid I don't. I think it's scandalous. Pupils are only failing their test because they are not ready to be driving on their own when they take it. With me, I will make sure you are ready when you take the test. I will not book your test until we are both in agreement that you are driving safely and well enough to be able to pass it. That is why I always do Mock Tests to confirm this. This is why my pass rate is consistently 75-80%. This means that out of every 20 tests my pupils take at least 15 are passing! Out of every 40 tests, 30 are passing! Out of every 100 tests, 75 on average are passing (not the national average of 47!!). If you're worried about the new (Satnav) test coming in in December, then worry no more. I have been to several meetings on this subject and am fully ready for the changes. If you look on the next page on this site you will see all the things I have been involved in over my many years as a Driving Instructor. All you need to do now is contact me on the ‘Contact Page’ and we will discuss your learning regime. Take the next step to gaining your licence and your freedom!! I will be happy to pick you up from any location you desire, whether that be college, work or home. You can book your theory test here.